Imagine a system where all information about all leads, employees and other useful data are organized in single software and easily accessible on multiple devices by multiple users. SalesFundaa CRM software is one such software where you will be able to organize all your leads, enquiries, projects, assign tasks and manage all sales cycle process. How do you manage enquiries for your business? Do you still use excel spreadsheet to maintain leads and enquiries? If the answer is ‘yes’, then its high time you start using SalesFundaa CRM software or else you will continue losing many business opportunities. With SalesFundaa CRM you can manage lead, enquiries and allows your team to track where the lead is in the sales cycle. Client detail like organization name, address, phone numbers, contact details, email id, and other vital information can be saved in SalesFundaa CRM. Add, delete data, check and update client history etc. can also be done. An authorized user can access the data remotely. Generate GST compliant tax invoices with SalesFundaa CRM. A good invoicing system is necessary for proper functioning of a company. SalesFundaa allows you to send invoices directly to the email address of the client. Moreover it provides custom invoicing. Maintaining a proper account system is vital for any company to grow. It helps in avoiding any malpractices, fraud within the organization. SalesFundaa CRM helps to track record and report all financial information. Maintain cash book, price book, GST returns, debit note & credit note, manage expenses etc. Profiling of your employees is of utmost important. Effective employee management is necessary to ensure that your workplace runs smoothly and efficiently. On the other hand poor management leads to unorganized work environment and will ultimately lead to closure of business. SalesFundaa CRM allows split employees in groups depending on their roles and responsibility in a company, generates pay slip, manage shift timings, assign tasks etc. 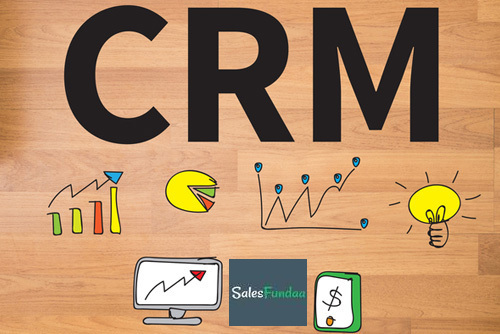 Each and every stage in sales process is covered in SalesFundaa CRM. Right from enquiry, lead generation to quotation management, sales order, work order, proforma invoicing, tax invoicing, debit/credit note, cash flow maintenance, project, product/service maintenance everything is covered. You don’t have use multiple software and can totally depend on SalesFundaa to manage everything. Send automated email campaigns to clients, bulk emails, birthday/anniversary wishes, set reminders about important meeting, due date of maintenance, invoice reminder etc. Automatic reminders are set so that you don’t miss an important deadline. Tally integration with SalesFundaa is possible. You can combine your data in Tally ERP 9 with SalesFundaa CRM software. This will save your valuable time which in turn will result in more business. Generate multiple reports with SalesFundaa. Moreover you can also create custom reports. Select the report type, columns, apply a filter and generate the report you need. Users have the option to download the report in pdf and excel format. Your valuable database will be stored on a cloud based server. We have made sure that your hard earned database is highly secured and you need not worry about data loss as the data is saved on a cloud server. Apart from this your employees can access and manage all functionalities of a CRM remotely, on any device with a secure login. SalesFundaa is the leading CRM software service provider in India. We provide feature rich, affordable services throught India. Get in touch with us for a Free Demo! Contact: +91-92-35-35-35-35- OR Email: [email protected] OR drop a comment below.